We are less than two weeks away from the college football season and can now leave the shadowy depths of our basements whereupon we were forced to endure slogging through the doldrums of sports television. Before the razzle-dazzle of downfield theatrics transpires, there must come something else and that is a solid, established and feared run-game. 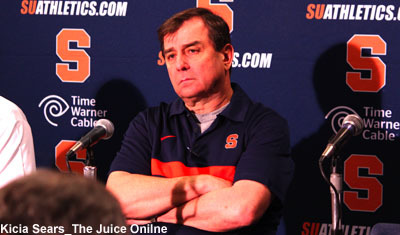 This isn’t really about Fine, however, or Boeheim nor is it about Syracuse. This, friends, is bigger than college basketball, bigger than any sport, really.